This blog post was written by Andrew Cannon, a research volunteer for GM1914 at Archives+ and is the last blog as part of the GM1914 Somme commemoration posts. Out of the millions and millions of regular men who went off to fight for King and Country in the First World War, only 628 of them were awarded with the highest military honour they could have received, the Victoria Cross. One of these men was William John George Evans. He was born in February 1876 in Kensington, London. Records show that he used the name George the most and I feel it is only right to use the name he preferred during this article. It would not be long until he would see some military action. He signed up to the Scots Guard in 1894 and was eventually sent out to South Africa in the famous Boer War. The Boer War was fought during the years 1899- 1902 by the British against the South African Republic. It is a place where the now famous historical figures rose to prominence and established themselves, names such as Lord Kitchener of the World War One recruitment posters and the, then war correspondent for The Morning Post, Winston Churchill. Contrary to popular belief, the concentration camps were a creation of the British to provide an area for families who had to abandon their homes. The Nazi regime adapted these camps as a tool to carry out their atrocities. Whilst he was on leave during the conflict, George would marry Clara Bates on 21 September 1900. Soon after returning from South Africa for good, he and his new wife would move up to Manchester in 1902 where they would settle due to George getting a new job working as an inspector for the, then newly formed, NSPCC. Mr and Mrs Evans would find a home on Greenhill Road in Cheetham Hill. It was here that Clara would give birth to George, the first of four children in total. The family would not stay in Cheetham Hill, though, as they would eventually move to Seedley where three more children would be born. Daniel Jones, Constance and Violet May would all be born within a matter of a few years. George signed up to the 18th Manchesters (3rd Manchester Pals) battalion in January 1915. This is where his remarkable story would begin. He was originally posted out as Private, but would be promoted to Sergeant on the same day. It is not clear why exactly he would be promoted so soon but it could be argued that due to his previous record in South Africa, he was elevated to a higher rank quicker than others. It would only be another two months until he would receive yet another promotion. on 18 March 1915, he was promoted to become Company Sergeant Major. The following year, he and his battalion would find themselves on the muddy, death ridden battlefields of the Somme. It is on the Western Front in which George would prove his bravery and reveal the reason why he was later awarded the Victoria Cross. 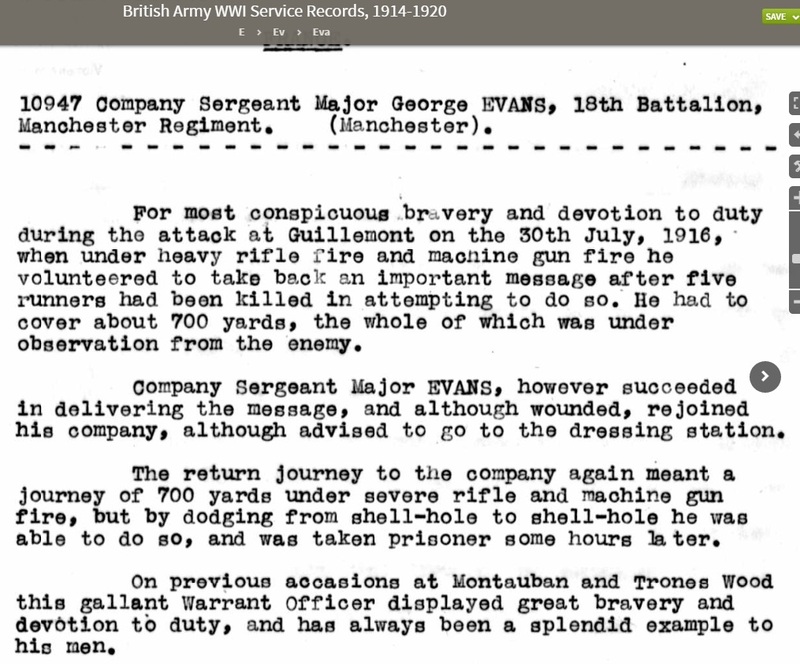 George and the 18th Manchester regiment were at the Battle of Guillemont in September 1916. The aim of the Battle was to try and push Fourth Army further forward to apply pressure to the German lines. During the three day battle in France, an important message needed to be sent by the British. A runner was sent with the message but was killed. A second runner was sent but was also killed. In total, five runners were sent and five were killed. George, bravely volunteered to send the message knowing all that had volunteered before him had been killed. The path of which he would have to follow was in plain sight and was being closely monitored by German forces. He would have to travel over 700 yards to pass on the message. He managed to do this successfully, despite being wounded by machine gun fire. He even made it back again to rejoin his fellow men. Just under two weeks later, he was reported missing on 11 September 1916 by the British and listed as a German Prisoner of War. He would wait out the rest of the First World War in a German prison until he was released a few days after the November armistice of 1918. George was officially demobilized in Preston at the Fulwood Barracks in February 1919. Luckily, he was able to return straight away to his former job at the NSPCC as an inspector. He would live out the rest of his days with his wife, Clara until his death in 1937. It is interesting to note how he mentions “young officers” and not soldiers in general. Is this perhaps a reflection of the British elite’s view of the regular soldier? Whatever the view of such people, many thousands of brave soldiers died over the course of those few months at the Somme and those heroes should never be forgotten.